Anne Hathaway has been living on a diet of kale and dust to get in shape to play Catwoman in forthcoming Batman movie 'The Dark Knight Rises'. 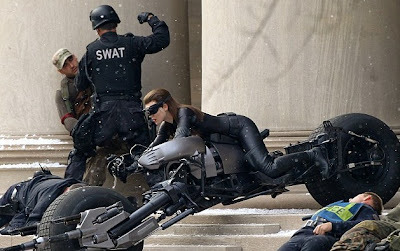 Anne Hathaway has revealed she devoted herself to training to "physically transform" into Catwoman for The Dark Knight Rises. 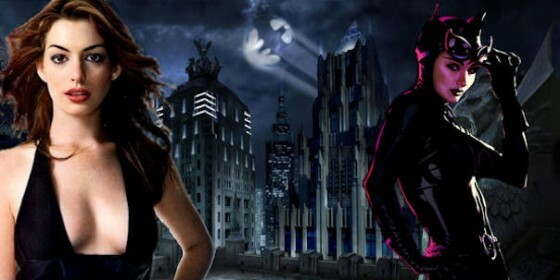 The 29-year-old, who wore a skin-tight leather cat suit to play Batman femme fatale Selena Kyle, told Entertainment Weekly that director Christopher Nolan asked her to be fit enough to perform all her own stunts. Anne revealed: "I had to physically transform. Chris sat me down at the beginning and said, 'Joseph Gordon-Levitt did all of his own fighting in Inception. That one zero-gravity fight? He trained for two months.'" She joked: "I basically left his office and went to the gym and just came out about five minutes ago.
" The One Day actress is now reported to be on a strict diet to play dying factory worker Fantine in Tom Hooper's film adaptation of Les Miserables. Meanwhile, her Dark Knight Rises co-star Tom Hardy defended his character's muffled voice, which some fans criticised after seeing the trailer. The British actor plays villain Bane, who wears a mask. He said: "It's a risk, because we could be laughed at - or it could be very fresh and exciting. "The audience mustn't be too concerned about the mumbly voice. As the film progresses, I think you'll be able to tune to its setting."